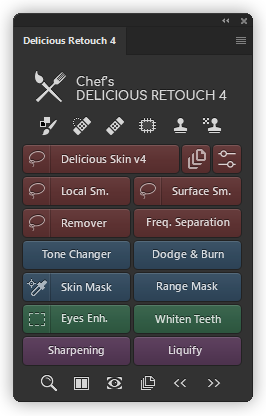 Chef's Plugins – Photoshop extension panels , scripts and actions for photographers. Turbo-charge your retouching workflow with a new version of Delicious Retouch plugin – set of powerful portrait & body retouching tools packed into a Photoshop extension panel. Handy extension panel for pro retouchers that has all the essential tools for dodging and burning, plus several unique features that you will speed up your workflow!